With fresh apples coming off the trees this month, it’s time to stock the pantry with Fall staples! This easy applesauce recipe can be used in many ways: tucked into a lunchbox, stirred into some morning oats, or baked into muffins to make them extra-moist and nutritious. You won’t run out of ways to savor this classic apple treat. We like using a mix of apple varieties as it makes for a more complex sauce, but feel free to use what you have on hand. Depending on the type of apple used you may need more or less sugar to reach your preferred level of sweetness. 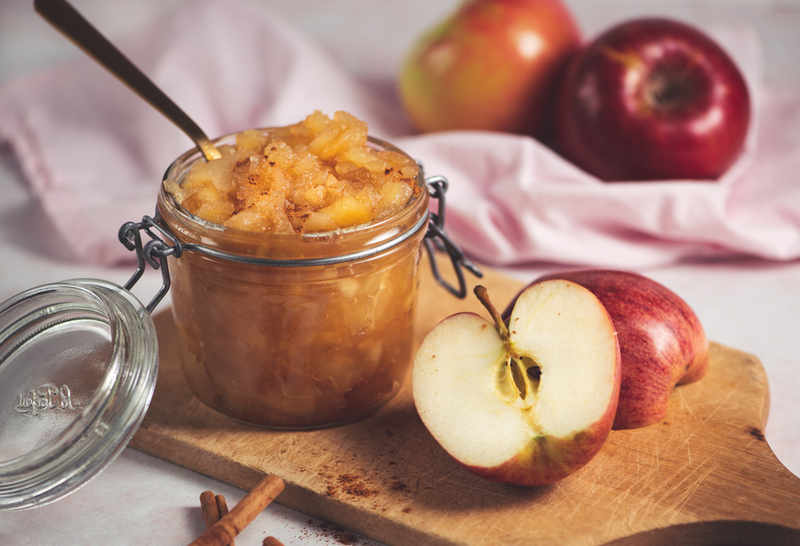 If you or your family are watching your sugar intake, look for sweet varieties, like Red Delicious, Fuji or KORU®, and try making the applesauce with no added sugar. Our tip: double the recipe and freeze the applesauce in individual portions for later use. You can also experiment with flavors by adding different spices, liquids, and fruit. Place the apples, 1/2 cup of sugar, water, lemon juice, and pinch of salt in a heavy sauce pan and bring to a boil. Reduce to a simmer and cook uncovered for 10 minutes, stirring frequently, until the apples start to soften. Reduce the heat to low, cover and simmer for another 15 minutes, stirring every few minutes and breaking up the apples as you go to make a chunky applesauce. Taste and add more sugar if needed, 1 tablespoon at a time, until the desired level of sweetness is reached. If you prefer a smoother apple sauce, cook for another 10-15 minutes and mash with a potato masher. Optionally, you can use a hand blender or transfer to a blender and blend until the applesauce is completely smooth. Remove from heat (if not already done) and serve warm or let cool completely. Store in the refrigerator in an airtight container for up to 4 days, or in the freezer for up to 2 months. * You can make this recipe with no-added sugar by selecting sweet apple varieties like Red Delicious, Fuji or KORU®. If the result isn’t sweet enough, add sugar 1 tablespoon at a time until the desired level of sweetness is achieved. Optional flavor additions: 1 tablespoon of chopped fresh ginger, 1/4 cup cranberry juice instead of water for a ruby red sauce (reduce sugar by 1/4 cup), add other fruit like apricots or strawberries. Suggested uses for the easy applesauce: muffins, cakes, oatmeal, yogurt, pancakes, and as a side for savory dishes like roasted meats or vegetable fritters.